Tver Region is turning into a Mecca for foreign investors. In late June, the region organized an investment forum for local administration and business to discuss challenges and share know-how. Not too long ago, Tver Region, which lies to the northwest of Moscow, was synonymous with the creepy backwoods—despite its ideal location on the road connecting the country’s two capital cities of Moscow and St. Petersburg. In 2009, Foreign Direct Investment accounted for only 1.8 percent of the local economy, and many motorists argued that Tver had the worst roads in Central Russia. Two years ago, the region overhauled its administration, and former paratrooper Andrei Shevelev became the new governor. Although one could have expected the former commando to keep to the conservative track, the new team of managers actively pursued a closer collaboration with foreign investors. This produced a dramatic impact on the region’s performance. Last year, Tver reported industrial growth at a level three times higher than the national average (which was 2.6 percent). The new regional government learned from the notable success of Kaluga—another Russian region with no oil and gas deposits. “Last year alone, we had 155 applications from potential investors. We give all the projects—even those that aren’t thoroughly worked out—our full support, with as little red tape as possible. Our region’s regulations make it possible for us to offer investors sites that are ready for construction,” Shevelev says, adding that every investor has his mobile number and can contact him whenever there is a problem. 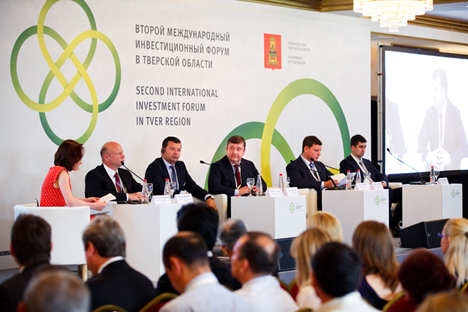 In late June, Tver hosted the Second International Investment Forum, which attracted an impressive 300 delegates. The forum resulted in nearly 100 investment projects, and the region’s investment portfolio is currently close to $5 billion, Shevelev says. “Businesses used to seek spots in Moscow technoparks, but the situation has changed: They now want to work near Moscow, which is more lucrative,” says Juergen Woerz, CEO of German Management Group. His company is currently in talks about the possibility of transferring of a part of the business to Tver, where Hitachi, OTTO Group Russia, Knorr-Bremse and many more have already launched projects. Hitachi, the Japanese manufacturing giant, plans to open a production of medium excavators—the most popular excavator class in Russia—in Tver this fall. “We had been looking for a convenient site for two years, but our decision to select Tver was based on the nice attitude of the local administration,” Sonosuke Ishii, managing director of Hitachi Construction Machinery Eurasia, told RBTH. Tver focuses on industrial parks—there is no other way for the region to encourage business, according to the deputy prime minister of Tver Region, Alexander Menshikov. “Infrastructure restraints and natural monopolies still impede business development,” he says. During the forum, Governor Shevelev promised investors to appeal to the federal authorities to ease access to the services provided by natural monopolies. Five years after the crisis of 2008, the roads in Tver and approaches to the city are still as bad as they used to be. The region’s obvious advantage is its ideal location; however, because of heavy traffic and poor roads, a 100-mile trip from Moscow to Tver takes up to 4 hours. However, there is a high-speed Sapsan train that runs between Moscow and St. Petersburg, making a stop in Tver. Sapsan takes commuters from Moscow to Tver in under 90 minutes. An agreement signed at the investment forum with the railway monopoly Russian Railways on the creation of transfer hubs in the region may improve the situation. Menshikov believes that, in the wake of the apparent stagnation in the European market, many companies have been thinking about moving to new markets. Some are considering Russia, and a ready infrastructure platform in the form of industrial parks will tip the scale in favor of the Russian region. “I can’t say that Tver Region has been successful in the past. We are trying to synchronize the creation of the park with the appearance of an anchor investor,” Menshikov said, adding that the region operates four parks, and three more will be created by the end of the year. “Those will be sites with anchor investors,” Menshikov says. The authorities will provide land, develop infrastructure, and find anchor investors that will draw other businesses and suppliers, while the park will begin working and paying taxes to the budget. The forum, aimed at promoting the joint implementation of international projects, became the pivotal event to complete the Year of Germany in Russia.